The updated design of the Hoover Dual Power Max Carpet Washer FH51000 combines user-friendly structure, elegant appearance and maximum functionality. The cleaner has become even more powerful thanks to two rotating brush rolls. The manufacturer promises us thorough cleaning and lightweight appliance at the same time. Is it possible and are these rotating brush rolls really effective and reliable? In this review, we will look closer at this cleaning system and discuss its pros and cons. We will also mention the important points our buyers had to say about this model. Unlike most carpet washers in the similar price bracket, this model is equipped with a powerful motor. Not many machines can compete with 10 amps of Dual Max power. For example, the Hoover Power Scrub Deluxe is as powerful, but it is also more expensive. With the two-tank systems, you can be sure that no dirty water can return to your carpet. This system is also very convenient in maintenance. The Dual Power FH51000 is equipped with large water tanks that can comprise enough water to clean large areas. Thanks to a gallon tank for clean water and 0.8 gallon tank for the dirty one, you won’t need to go back and forth to the bathroom for refilling the water with formula and draining the dirty water. One filling is just enough to clean a medium-size flat. The main distinction of this appliance from other Hoover carpet washers lies in the special design of its cleaning tool. Instead of a standard Spin&Scrub brushing tool, the Dual Max is provided with two Spin Max Powerbrushes. These brush rolls are able to get more dirt out of your carpet and make the cleaning deeper. Our customers have confirmed the effectiveness of the DualSpin Max cleaning system. According to them, it works well even on carpets with log fibers. Large nozzle with long brush rolls will help you get your carpet clean much faster. The Hoover Power Scrub Deluxe has a 13-inch removable nozzle, which covers bigger areas than most of the standard brushing tools do. It can also be easily cleaned out of hair or any fibers that may stick to the brushing rolls. When it comes to manipulation, weight is a very important issue. A large and heavy carpet cleaner may work super effectively, but can also be highly inconvenient in use. However, the Dual Power Max Carpet Washer is from a totally different story. When empty, it weighs only 18 pounds, so you can easily move it around the house, including stairs. But if you are looking for a really lightweight carpet cleaner, you should check the Hoover Power Path Pro Advanced Carpet Washer. Assembling the Dual Power FH51000 is completely trouble-free. There are no parts to be connected or adjusted. You can use the machine right after unpacking. In addition to the machine itself, you will get an upholstery tool and the hose that is 8 feet long. These tools will help you clean every corner of your apartment or house, including furniture, fabric décor, and stairs. You will also get a bottle of Clean Plus 16 0z formula. The long power cord is also an important detail. The Power Max with its 20 feet long cord enables you to clean half of the apartment without any need to unplug and plug again the machine. The power cord automatically retracts inside, so you won’t get lost in wires. The feature of Clean Boost Control is intended to help you clean the stains that have been set on your carpet for a long time. You can use it to spray some more cleaning formula on especially dirty areas. The manufacturer offers the two-year warranty on the Dual Power Max Carpet Washer FH51000. Designed for exceptional users’ comfort, this carpet cleaner is one of the newest creations of Hoover engineers. It combines all the latest technologies and know-hows. That is why this machine can be acknowledged as one of the most convenient carpet cleaner available on the market of household appliances. Thanks to the new design, the machine is super lightweight. Unlike most of the upright carpet cleaners that weigh more than 20 pounds, the Dual Power FH51000 weighs only 18 lb. The removable tanks are easily filled with water and cleaned. So, if you want to fill the water, you don’t need to take the whole machine to the bathroom. That makes the cleaning process simple and effortless. When comparing the Hoover’s standard SpinScrub brushes and this new Two Brush Rolls system, our buyers state that both of the cleaning tools are very effective. The SpinScrub brushes clean carpet fibers in a horizontal way, while the brush rolls are able to lift the fibers up and take away the dirt between them. Another important distinction of the Dual Roller Brushing System is that, in opposite to most of the carpet washers from Hoover, it has belts as a part of it. There are some customers who have concerns whether they can clean their Berber carpets with the Dual Roller Brushing System. A Hoover representative has assured users that the Dual Power Max is totally safe for this type of carpets. If you still have some worries, you can contact the Hoover Company or test the machine’s work on some small area of your carpet. 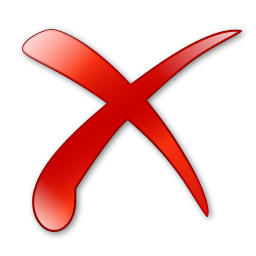 However, we have no reason to state that this appliance may cause any damage to your carpets or textile. Parents and pet owners know how quickly a clean floor covering can become a mess. Juice, milk, sauce, soup, soil, urine and many other things can cause terrible stains on your carpet only in a few minutes. Such stains can be cleaned for hours. The Hoover Dual Power Max FH51000 is the perfect solution to such problems. Even if your carpets already have some set stains, the Clean Boost System will help you get rid of them without any extra effort. And for those of you who have the constant issues with pet hair, the brush rolls will become an answer to your prayers. 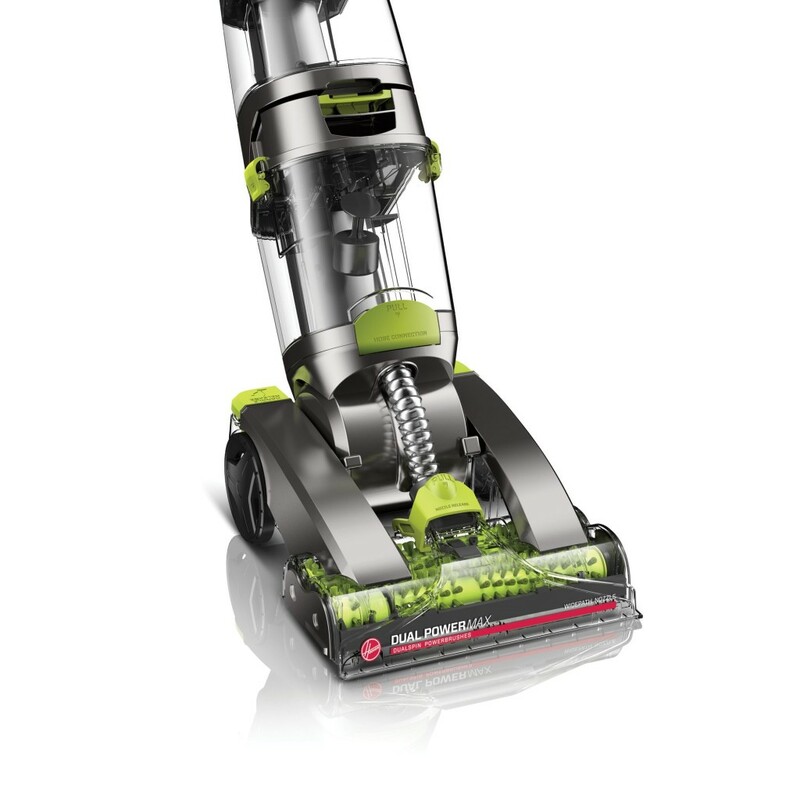 Our buyers find the Hoover Dual Power Max extremely effective. They say it cleans floor covering even more comprehensively than the Rug Doctor. Thanks to the Heated Drying feature, the drying time will become much shorter. This means that you will be able to use your floor covering much sooner. The official policy of the Hoover Company states that if you want to achieve the best results with the cleaning machines it produces, you should also use the cleaning solutions made by their brand. 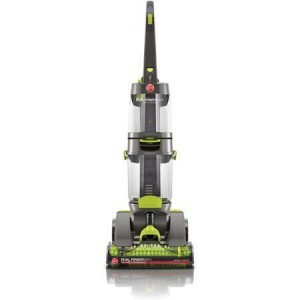 The customers who have purchased the Dual Power Max FH51000 usually buy cleaning solutions like Hoover PetPlus Concentrated and Hoover CLEANPLUS 2X. According to the customer reviews, the main issue that can be called a drawback of this model is the belts in the Dual Roller Brushing System. Some users complained that after a few months of functioning the belts on their devices broke. As this model has been on offer only starting from 2014, there are no trustworthy investigations of this problem. 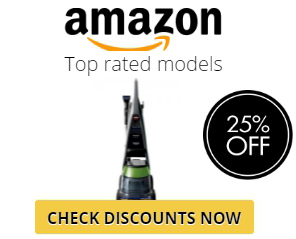 In case you want to purchase a model with better “reputation,” you should check the Hoover Power Path Pro Advanced Carpet Washer or the Hoover Power Scrub Deluxe. The first device is equipped with brushing rolls, but, unlike the Dual Power Max, has more positive reviews. The second appliance is from the line of standard SpinScrub carpet washers.